It wasn’t that I existed all these years without encountering bluegrass music. As a freshman at Haverford College in the 1970s I lived across the first floor of Barkley Hall from two upperclassmen — Peter Doan and Evan Lippincott — whose vinyl collection included the 1972 Nitty Ditty Dirt Band’s Will The Circle Be Unbroken. 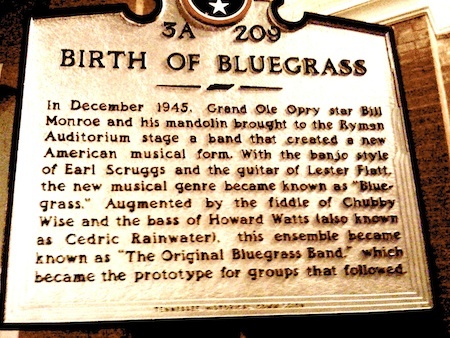 But not until this summer, when I arrived in Owensboro, Kentucky, where the International Bluegrass Music Museum is located, did I more fully understand the dimensions of the bluegrass music scene, its resonance with a new generation of young adults, its marvelous mix of creativity and language, melody and musicianship. The music is just plain great and getting better. Last week I had the good fortune of being in Nashville to attend the annual International Blue Grass Music Awards show in the 119-year-old Ryman Auditorium (see pix left), where bluegrass was born in 1945. Steve Martin, the comedian, author, banjo player, and member of the Steep Canyon Rangers, won the Entertainer of the Year award, the evening’s highest achievement. 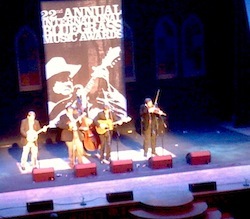 The Boxcars won the Emerging Artist of the Year award. This year the bluegrass nation marks the 100th anniversary of the birth of Bill Monroe, the Kentucky mandolin player credited with developing the genre. There were lots of performances during the show that celebrated Monroe’s contributions and also expressed the breadth of the music. Each was superb. A fuller account is here on Bluegrass Today. 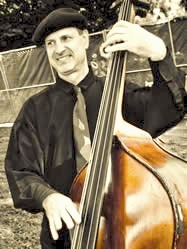 Among the nominees — for Bass Player of the Year — was Mark Schatz, one of American bluegrass music’s best musicians and a roommate of mine during our senior year at Haverford. Twice previously, Mark won the Bass Player of the Year Award, so his bonafides in the business and among bluegrass lovers is assured. Taking a moment here to consider the men in our Haverford suite and their exploits. One is a top commander in the Washington, D.C. Metropolitan Police Department; a second is a federal housing official in Birmingham; a third teaches English at Temple University, a fourth is a computer engineer who found success in California’s silicon valley. It’s an interesting group, then and now. The last time I caught up with Mark was a few years ago, when he was Nickel Creek’s bass player, and the band performed a summer concert up the road from here in Interlochen, Michigan. Nickel Creek had already announced it was breaking up. One of the many things I recall from that conversation was Mark’s assurance that he’d be able to find another gig. He said it with a bright laugh. That’s how it turned out. He’s now part of the Claire Lynch Band. As a young college student Mark spent his time with other musicians. He played banjo and mandolin and bass, and probably a few other instruments. He’s a quiet guy and clearly prefers to speak through his fingers and the strings. He spent his first few years after Haverford playing on the streets of Boston with Bela Fleck, another accomplished musician. Both are from the Boston area. Mark (see pix right) has two solo recordings, Brand New Old Tyme Way and Steppin’ in the Boilerhouse, both on Rounder Records. He’s also released two instructional bass videos on Homespun. I wasn’t able to catch him in Nashville but have kept abreast of Mark’s exploits. His older brother, Gordon Schatz, and Reed Schneider, my older brother, also are Haverford grads and close friends. One last point about Nashville, a city of 601,000 and just behind Washington, D.C. as the 25th largest city in the United States. There’s not a lot going on in the streets by day. They’re flanked by sealed glass office towers. But by night it’s a blast. 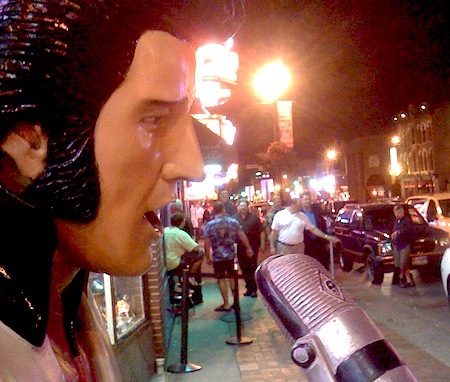 Broadway in Nashville (see pix below) is chorus of contemporary sound. The singers at the Karaoke bars perform as well as the originals, and the street musicians are even better than that. Such energy and talent. It gives me reason to believe we’ll make it through this bizarre and dangerous era of dim American leadership. A country that capable of developing young artists will endure. Wow – so you were at this year’s award show – that’s wild! Nice little retrospective about the bluegrass world. Sorry you didn’t have a way to connect with me while we were there. Here’s my cel# for future reference: 443/994-0589. Check out the CD I made a year or two back with Claire (Whatcha Gonna Do) – it’s sweet – opening track starts with a bass lick!